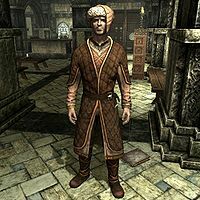 Giraud Gemane, a Breton, is the Dean of History at the Bards College in Solitude. He teaches history and can often be found on the ground floor library, keeping a watchful eye on the students, or found drinking in the Winking Skeever. During his studies, he recently discovered that Svaknir's missing contribution to the Poetic Edda was to be found in Dead Men's Respite. This discovery will prove more than useful during the quest Tending the Flames. After the quest, his research will also lead to the recovery of Rjorn's Drum. Lastly, Giraud is the master trainer in Speech. Giraud wears a set of fine clothes with a matching hat and pair of boots. He carries an iron dagger to protect himself. Aside from this, he also carries a belted tunic, a key to the Bards College, and a selection of common loot and gold. During the lesson time at the Bards College, he was supposed to randomly converse with his students, but due to a bug, their response lines will never be heard. Giraud: "Pardon me, but I trust you've been working on your poem, on the classical heroes of Skyrim, yes?" Aia Arria: "Must it be written? Poetry is so dull when it isn't set to music." Jorn: "Yes sir, Professor Gemane! It's a war epic about Hoag Merkiller's last stand!" Illdi: "Why do we always focus on retelling the old stories? There are so many new stories being made, right now..."
Giraud: "Patience, Illdi. We study the heroes of the past so we can have better understanding of the heroes of today... and tomorrow." Giraud is a member of the thief class, which determines the level of his skills. He is the author of Songs of Skyrim, as well as the revised edition. The option to train with Giraud may not be available after finding and/or returning Rjorn's drum. The student's responses to Giraud are marked as being delivered to other instructors, so their lines will never be heard. Giraud will speak his lines, but the student's line will be skipped.